Home/News/What Should be Paid Attention to in the Process of Juice Production? Recently, pure fruit juice beverages are consumed all over the world, and large and small juice processing factories emerge. Thus, people do not have to walk into the orchard or wait for the fruit to ripen, they can enjoy a variety of fruit juice flavors easily at home. 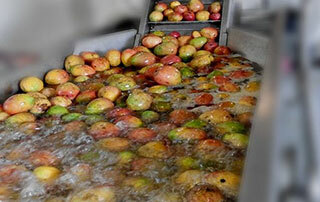 For the production enterprises, how to solve the production technology of fruit juice beverage is a new subject. 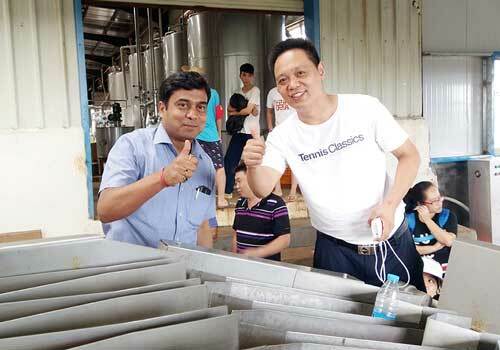 So, in the process of fruit juice beverage production, what we need to pay attention to? The choice of fruit ingredients. When choosing the fresh fruit to produce juice, the ripeness of fruit is very important. Ripe fruit is fragrant and sweet, the ripeness of the sweetest fruit is between 80% and 90%. Too ripe fruit is not suitable for production, which can cause unpleasant smell. The production of guava paste is a very good example. The immature guava is as hard as stone, which is tasteless and difficult to break. Ripe guava is easy to produce, and the whole workshop is full of the guava aroma. Too ripe guava may have worms and also the smell of rotten fruit. The prevention of pesticide residues. First of all, it is necessary to understand whether or not the insects of processing fruits are exterminated by spraying pesticides. If it does spray, the measures of removing the pesticides is needed. A method is to soak with dilute hydrochloric acid for 20 minutes, brush with sprayer and rinse with flowing water. The method can remove the residual pesticides from the epidermis of fruits. The prevention of excess ethephon. Now many beverage factories prefer to produce mango drink by making their own mango jam. The promoting ripeness of mangos is to use ethylene, so the peel and pulp of mangos may contain a lot of ethylene. Excess ethephon is harmful to the health of consumers. A very effective method is ozone tracking neutralization method. The ozone can not only neutralize the ethylene in the flesh of mango skin, but also completely eliminate the bacteria on the mango epidermis. The importance of high pressure homogenization. High pressure homogenization is not only for good affinity of products, no precipitation and exquisite taste, but also further refinement of a variety of ester aromatic grains in fruits. It makes people feel very fragrant when they drink. No wonder the producers of drinks often say that the competition in the fruit juice industry is essentially a competition of homogeneous effects. Avoiding heating as much as possible. Almost all fruit juices cause heat foul odors and nutritional losses when high temperature heating. In fact, in the process that must be heated, instantaneously heating to the desired temperature, and then cooling below normal temperature at the fastest speed. The nutrition and flavor have hardly changed. Aseptic filling can achieve this purpose. The juice beverage produced by this method can be compared with the fruit juice which is sterilized by ultra high pressure and normal temperature at the same time, and can achieve the purpose of commercial asepsis. Right amount of vitamin C. Crushing, grinding, homogenizing, heating and other processes cause vitamin C loss in juice. Proper addition of vitamin C (multi vitamin C) can protect color, resist oxidation and prevent the loss of fruit juice nutrition. Controlling of total acidity and pH value. The controlling of total acidity and pH value can adjust the taste and improve the flavor. In order to make the products have mellow taste, citric acid and malic acid can be used simultaneously, which can receive good results.